Greg / September 27, 2013 / Comments are off for this post. Several years ago, there were many people who thought “going green” was just a passing fad. Today, however, even major companies such as Walmart are now starting to get on board with the whole movement. As you’ll read in this article from Huffington Post, Walmart now has a policy which will rid many of the harsh chemicals, which can harm people, pets, and the environment, from household and personal products. The commitments made today will impact some 20 percent of the consumables sold at Walmart stores nationwide — the non-food products that you can pour, squeeze, dab or otherwise apply to your body or use in and around your home or car. This includes everyday products like shampoo, baby lotion, cosmetics, paint, spray cleaners and air fresheners. This commitment promises to make thousands of healthier and safer products available to the 80 percent of Americans that shop at Walmart. It is a first and important step that must be followed through with meaningful implementation. At EDF, we will be closely monitoring and verifying the reduction of hazardous chemicals and shift to safer ingredients, ensuring the promise for healthier products becomes a reality. Greg / September 24, 2013 / Comments are off for this post. When it comes to the toughest room to clean in your home many people think of the bathroom. While in many cases this may actually be the toughest room to clean, it doesn’t necessarily make it the dirtiest. In fact, the kitchen is often times the dirtiest room in your home. Think about it, the kitchen is the room with the most visitors on a daily basis, not to mention the area where food is prepared and discarded. This also means your kitchen probably has the most dirt and germs. In this article from Enviro Maids, they discuss the areas in your kitchen which are most likely the dirtiest, and ways to clean them. Of all the rooms in your house, the kitchen gets the most foot traffic and use. The kitchen is the hub of the home where meals are prepared, children tackle their homework and friends are entertained. It’s no surprise that with so much use, the kitchen is a breeding ground for germs, dirt and grime. It’s important to be aware of some of the common spots in your kitchen that can harbor dangerous germs and bacteria and to learn how to sanitize them. These cleaning aids do a great job of getting the oily, sticky residue off dishes and pots and pans, but if they’re not routinely sanitized they quickly become overloaded with bacteria. According to NSF International, a public health organization, 75% of sponges and dish rags contain disease-causing bacteria such as E. coli. When using these microbe-filled sponges and rags to wipe countertops you are unwittingly spreading harmful bacteria around to surfaces in your kitchen. The solution? A quick and effective way to sanitize a sponge is to dampen it and zap it daily in the microwave on high for two minutes. Let your dish rag dry out completely between uses and use a clean one about once a week. Wash and dry rags on the hottest setting. Many people don’t think about washing their sink. Hidden areas in and around your kitchen sink such as the faucet handle, the gasket around the garbage disposal and the drain stopper are holding onto dangerous disease-causing pathogens. According to Woman’s Day, lower your chances of foodborne illnesses by cleaning your sink immediately after washing raw chicken, meat and vegetables. Use a disinfectant around the entire sink, faucet, faucet handle, garbage disposal gasket and the drain stopper. Your coffee maker is routinely brewing cups of coffee, but it may not routinely be getting cleaned. In addition to hot coffee, your coffee pot reservoir can be serving up mold and yeast. To remove the ick factor, wash the individual parts of your coffee maker daily. Once a month, run a cycle with just vinegar followed by several cycles of clean water. These areas fall under the “I didn’t even think to clean them” category. Think about how many times a day someone is grabbing the cabinet handles or pulling on the refrigerator handle. Imagine all the bacteria and grime that accumulates over time. Make a note to include these areas as part of your regular cleaning routine. Even with a bag lining your kitchen garbage can, food particles, liquids and contaminated chicken, meat and fish juices can leak through. That unpleasant odor emanating from your trash can is a telltale sign that bacteria is lurking and your garbage can is in need of a good scrubbing. Take it outside once a week and spray it inside and out with a disinfectant and give it a good scrubbing. Using reusable cloth grocery bags is an important step in helping to eliminate the use of plastic grocery bags. However, according to a University of Arizona/Loma Linda University study, half of the reusable cloth bags they tested came back positive for E. coli. What many fail to realize is that most reusable bags are made of porous, non-washable materials so they soak-up contamination from food and liquids. Look for bags made of washable cotton and launder them after each use (especially when transporting meat and chicken), or at least once a week. Greg / September 20, 2013 / Comments are off for this post. Does your home have mold? Mold may be growing in certain areas of your home and you may not even know it. If your home does have mold, removing it as quickly as possible is definitely advised. Mold can cause damage to your home but it can also cause problems to your health, especially if you or someone in your family suffers from allergies or asthma. In this article from our friends at Enviro Maids, they explain what exactly mold is, how to detect if it is in your home, and ways to remove and prevent mold. Mold is a four-letter word for some homeowners. Depending on where you live and if you have moisture problems in your home, you may have a mold problem. Mold thrives in damp, dark environments, and after Hurricane Sandy, mold problems became even more troublesome for many homeowners as flood waters invaded their basements. Not only is mold smelly and unsightly, it can pose a health risks for many. With the help of the EPA and CDC, we’ll answer general questions about mold — what is mold? How do I know if I have it in my house? Is it harmful? How do I get rid of it? How do I prevent it from growing? Molds are musty-smelling fungi that can be found both indoors and outdoors. Molds thrive in warm, damp, and humid conditions. Basements and crawl spaces are the ideal places for mold to grow. Molds reproduce through tiny spores invisible to the naked eye that float through outdoor and indoor air. When these spores attach to indoor surfaces that are wet, they begin to grow and multiply. As long as there is moisture present, mold can grow on many surfaces including wood, leather, paper, and carpet. How do I know if my house has mold? The simplest way to determine if you have mold in your house is to follow your nose! Large mold infestations have that distinct musty odor. Basements are the main source of mold, that’s why they’re notorious for having a musty smell. Once you smell mold, look for its presence on exposed surfaces such as walls and ceiling tiles. Mold often looks like black, brown, green stains or a fuzzy white film. Some people are more sensitive to molds than others especially allergy and asthma suffers and people with some lung conditions. For these people, exposure to molds can cause symptoms such as nasal stuffiness, redness and watering of the eyes, wheezing, or skin irritation. Some people, such as those with serious allergies to molds, may have more severe reactions. It’s impossible to get rid of every trace of mold. The goal is to remove as much mold as possible and then to take measures to prevent mold spores from growing into unhealthy levels. As long as the moisture problem has been resolved, these spores will not grow. Consult with a professional to help with your specific mold problem. According to the EPA, the use of a chemical or biocide that kills organisms (including chlorine bleach) is not recommended for mold cleanup due to the harshness and toxicity of these chemicals. There may be instances, however, when a professional may suggest its use. To remove mold contained to smaller areas, scrub hard surfaces with detergent and water, and dry completely. Porous materials, such as ceiling tiles and carpet, may have to be thrown away if they become moldy. Use air conditioners in the summer and install dehumidifiers in the basement to lower indoor humidity to less than 60%. Vent bathrooms and dryers to the outside. Add insulation to prevent condensation on cold surfaces such as windows, piping, exterior walls, and roof. If the source of mold is due to a leak or if water is getting inside the house from the outside, fix the source of the water problem. Make sure the ground slopes away from your house and that gutters and downspouts are functioning properly. Remove or replace carpets that have been soaked and cannot be quickly dried. Greg / September 17, 2013 / Comments are off for this post. Autumn is the time of year when kids are participating in sports like soccer and football, both of which lead to grass stains galore. Even if your child isn’t playing an organized sport, there is a good chance that they will still manage to find a way to get some grass stains on their jeans while playing with friends. Not to worry, in this article from eHow, you are shown 2 different methods to naturally rid clothing of grass stains. Regardless of how the grass stain came to be on a garment, it’s important to understand the makeup of a grass stain in order to remove it. A mixture of organic matter, proteins, grass juices and other pigment components form a grass stain. This combination adheres and binds with the natural fibers of the cloth. The grass stain binding with the natural fibers is what makes removing the stain frustrating and difficult. White vinegar is a low-cost, effective method to removing grass stains in clothes . You can apply undiluted white vinegar directly to the stain and let it soak overnight. By morning, the grass stain should have lightened. Laundering the item as normal should remove the grass stain. 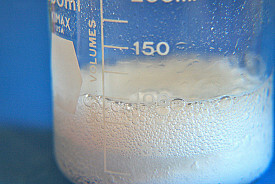 An alternative is to make a solution of one part vinegar, one part rubbing alcohol and one part warm water. Pretreat the stain with this mixture, using a sponge to rub the mix into the stain. Allow the mixture to set on the stain for 10 or 15 minutes before laundering as usual. If the stain has not vanished after washing, repeat this method. Pretreat a grass stain with rubbing alcohol by first applying the rubbing alcohol directly on the stain and letting it dry. After the alcohol has dried, rinse the stain in cold water. Now work a little enzyme detergent into the stain, then rinse again with cold water. Allow the material to air dry before washing the garment in the normal manner. Greg / September 13, 2013 / Comments are off for this post. Floods can be extremely devastating and come almost without warning. A flood can cause damage to a home or business in many ways. The damage may be a ruined rug or floorboard, furniture, utilities, or even the buildings foundation. 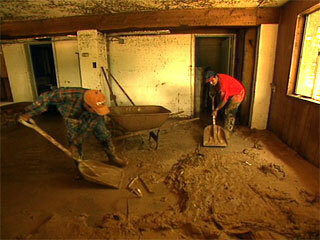 Cleanup after a flood can be a long and difficult process but a proper cleanup is very important. According to the EPA, failure to remove materials that have been contaminated during the flood, can severely effect your indoor air quality which can lead to long term health problems. Here is an article from Flood Safety, which has guidelines for a proper flood cleanup. We hope this information will be helpful, especially for our friends in and around the Boulder area who have been effected by recent flooding. Wallboard acts like a sponge when wet. Remove wallboard, plaster and paneling to at least the flood level. If soaked by contaminated floodwater, it can be a permanent health hazard and should be removed. If most of the wallboard was soaked by clean rainwater, consider cutting a 4- to 12-inch-high section from the bottom and top of walls. This creates a “chimney effect” of air movement for faster drying. A reciprocating saw with a metal cutting blade works well, but use only the tip of the blade and watch out for pipes, ductwork and wiring. If your basement is full or nearly full of water, pump out just 2 or 3 feet of water each day. If you drain the basement too quickly, the pressure outside the walls will be greater than the pressure inside the walls. That may make the walls and floor crack and collapse. With wood subflooring, the floor covering (vinyl, linoleum, carpet) must be removed so the subflooring can dry thoroughly which may take several months. Open windows and doors to expose the boards to as much air as possible. Clean and dry carpets and rugs as quickly as possible. If sewage-contaminated floodwater covered your carpeting, discard it for health safety reasons. Also discard if the carpet was under water for 24 hours or more. To clean, drape carpets and rugs outdoors and hose them down. Work a disinfecting carpet cleaner into soiled spots with a broom. To discourage mildew and odors, rinse with a solution of 2 tablespoons bleach to 1 gallon water, but don’t use this solution on wool or nylon carpets. Dry the carpet and floor thoroughly before replacing the carpet. Padding is nearly impossible to clean so should be replaced. If the carpet can’t be removed, dry it as quickly as possible using a wet/dry vacuum and dehumidifier. Use a fan to circulate air above the carpet, and if possible, lift the carpet and ventilate with fans underneath. Wooden floors should be dried gradually. Sudden drying could cause cracking or splitting. Some restoration companies can accelerate drying time by forcing air through the fluted underside of hardwood floorboards. Remove hardwood floor boards to prevent buckling. Remove a board every few feet to reduce buckling caused by swelling. Clean and dry wood before attempting repairs. Defective flashing– Flashing is the sheet metal used in waterproofing roof valleys, hips and the angle between a chimney and a roof. Wet spots near a chimney or outside wall may mean the leak is caused by defective flashing, narrow flashing or loose mortar joints. Look for corroded, loose or displaced flashing on sloping roof valleys and at junctions of dormers and roof. Clogged downspouts or eaves– Check for choked downspouts. Accumulated water or snow on the roof above the flashing may cause a leak. Ice accumulations on eaves sometimes form ridges, which cause melting snow to back up under the shingles. Cracks and deterioration– Roofing (especially wood or composition shingles) usually deteriorates first on southern exposures. Check southern slopes for cracking or deterioration. Holes– Missing shingles or holes in the roofing may be causing wet spots. To find holes, check for a drip trail or spot of light coming through in the attic. Stick a nail, straw or wire through the hole to mark the spot on the outside. Greg / September 10, 2013 / Comments are off for this post. I’ve had many posts about green, homemade, alternative ways to clean your home. Almost every homemade cleaning concoction seemed to use either vinegar, or baking soda. But what exactly is baking soda? This article from NewsOk, should not only explain what makes up baking soda, but also tells you about the many different uses it has. As a dedicated DIYer and a self-proclaimed aficionado of any and every homemade cleaning product out there, I have to say: I use a LOT of baking soda. To anyone who makes their own eco-friendly cleansers and cosmetics, you know that baking soda is your best friend. It’s safe, neutral, edible, and incredibly effective in everything from nontoxic DIY Draino to all-natural homemade deodorant. But after years of using this stuff on a daily basis, it sort of struck me — I don’t actually know what it is! So I went searching. There are deposits of pure nahcolite which occur naturally in the Green River Formation, which spans a few states in the Central US. The Green River Basin alone houses a 200-billion ton nahcolite deposit — enough to supply the entire world with baking soda for many hundreds of years. In water, baking soda is mildly alkaline and can be used to neutralize acid. That’s why it works so well dissolved in water as a natural antacid remedy, or as a way to remove rust from old metal, or to remove tarnish from silverware. Its alkalinity is also why it acts as a deodorizer — by counteracting slightly acidic scent molecules. But baking soda’s amphoteric qualities come in useful too. That’s how it enhances homemade laundry detergent and clears up pools and fish tanks, by balancing the pH level. The bottom line: Yes, baking soda is natural and environmentally-friendly. Best of all, it actually does all the things we use it to do — even science says so! So before you call that Dallas cleaning service, try a little baking soda! Greg / September 6, 2013 / Comments are off for this post. Keeping with the whole “back to school theme” (my last post was about preventing head lice in kids), I thought we’d take a look at how to send the kids back to school the green way. In this article from Big Spring Environmental, they literally show you the ABC’s of going back to school green. You are given tips on things like, how to cut back on waste at lunch, eco friendly supplies, and better ways to commute to and from school. It’s hard to believe that summer is coming to an end and it’s time for students to head back to the classroom. Why not make preparations for the new school year fun and purposeful by “thinking green?” Stop for a minute and think about how much waste goes on in schools with just the notebook paper, plastic sandwich bags and paper sacks that are discarded. According to Ethical Ocean, 35 to 45 percent of trash in the solid waste stream comes from institutions like schools. Of that share, 40 percent of the total waste stream is composed of paper products. Big Spring Environmental has put together a short lesson on back-to-school shopping and planning to help students and parents reduce this and other waste. A is for Apple: Okay, so they may not be Macs from Apple Computer, but many schoolsare starting to incorporate computers and online schoolwork and textbooks into the classroom, which will significantly cut down on paper waste over time. One of the first and largest computer initiatives in history was launched by the Huntsville City School System last year and it is a great model for leaving a smaller carbon footprint. When back-to-school shopping, buy paper products including notebook paper, notebooks, sticky notes and tissue that are made from recyclable materials. There are many interesting and eco friendly school supplies that are great for back-to-school needs. B is for Boxes: In addition to paper waste in schools, there is also the issue of lunch packaging waste. According to Ethical Ocean, the average school age child throws away 67 pounds of lunch packaging waste each year, which amounts to 18,760 pounds per average elementary school! That is a staggering amount of waste that could be reduced dramatically by using lunch boxes and reusable Tupperware containers. Also, putting multiple food items such as fruits and vegetables in the same container adds to the reduction in packaging waste. C is for Clothing: One of the biggest costs of returning to school, besides school supplies, is new clothing. Most students want to look good for their return to campus but there are other ways to look good without breaking the bank, while reducing clothing waste. Why not throw a clothing swap party for the kids? Everyone brings clothes they they no longer want to trade for gently used items. It’s simple, fun and a great way to recycle clothing and get a new personal style. Shopping and donating at a consignment store is another way to add new style the “green way,” plus you earn money by donating the clothing you no longer want! All good lessons need a teacher to present them, but our “T” word is transportation. The task of transporting the kids to and from school continues long after the back-to-school wave has crashed. Walking or biking to school instead of driving or riding in a car saves greenhouse gases from being emitted and gives the student more exercise. Being conscious of how your actions affect the environment can help students realize that healthy habits and going green can go hand in hand. Carpooling is another way to reduce carbon emissions. It’s a great lifestyle practice to “go green” as often as you can and incorporate it into more aspects of your life. Other people will catch on and the reduction of waste and greenhouse gases will be more noticeable. Go green when going back to school this year and help spread the word that the green way is the best way! Greg / September 3, 2013 / Comments are off for this post. Back to school time can be a very exciting time for a child. As a parent, it can also be a rather stressful time for you. Besides your worries that your child is safe, doing well in class, and making friends, there is another issue which is sometimes forgotten about at school until it’s too late… head lice. 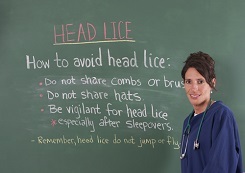 Head lice outbreaks are fairly common but a problem nontheless. In this article from Backup Care, you are given several tips on how to prevent your children from getting head lice and/or transfering it from one child to the next.